At Red Eleven we’ve got a unique facilitation process. We use a method we call, “Pull, Translate, Push.” We pull your ideas out, translate them visually, and then push them back to you as clean visuals you can use for communicating internally or externally. Discovery. We meet or talk on the phone for a complimentary 60-minute collaboration session. The goal is to co-create a plan for the event, usually a half-day or full-day session. Often an extended plan includes multiple dates depending on what challenges you want to overcome. Proposal. 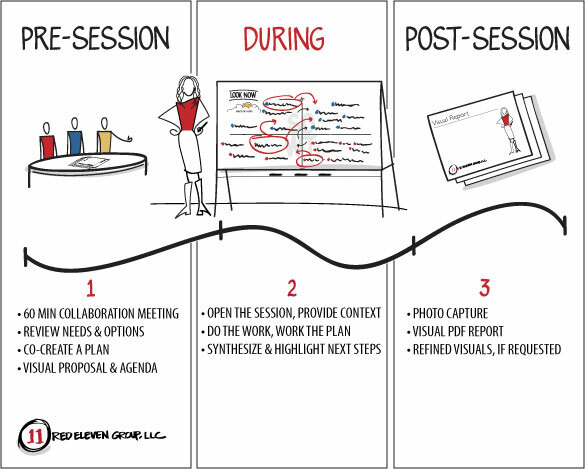 Red Eleven sends a visual proposal that reflects our conversation and shows the visual tools and processes we will use for the day, plus a summary of desired outcomes. Confirm and Plan. We schedule your day and secure a room for the session. Beginning. We kick things off by doing introductions, talk about why we are here, and then we review the fundamentals of session success. Middle. During the session we work big, on the walls with large paper or on whiteboards. Your Red Eleven facilitator asks questions and guides the process (Pull), and visually captures the group’s ideas with sketches and words (Translate). End. In the wrap up portion of the day we review the highlights and talk about options for next steps. Everyone leaves with a smile and a new fire in the gut to go out and make things happen. Visual Report. Photographs are taken of the walls which become a visual report that you keep and re-purpose for your own communication needs (Push). Visuals Re-Created. The work we do together is part of your story, and you should share it. Upon request, our creative partners will take it to the next level for you, creating cleaner versions of the visuals that you can use as graphics to better reach your internal and external audiences. These can come in the form of large murals, simple icons, slide presentations, and much more. Make it Happen. The planning session is the fun part. But you won’t make it a reality without some added accountability to help you get there. As we discuss next steps, your Red Eleven facilitator lays out options for consideration, often including a quarterly accountability session. This allows the leadership team a regular means of checking and implementing the strategy. Without this step, your chances of success take a nose dive. Contact Us to get started. We’re here to help.